What’s the most important knife in the kitchen? For many, it’s the chef’s knife, alternately known as the cook’s knife. The best chef knife is one that can take on many tasks; it can be used to chop vegetables, work through heavy joints, and handle a variety of other jobs with ease. Chef’s knives come in different lengths, usually between six and fourteen inches. Most are eight inches long, and most have blades that are 1 ½ inches across at the widest point. Both French and German chef’s knives are popular; the French chef’s knife features a nearly straight edge that curves up toward the tip at its end, while the German chef’s knife features a rounder, more continuous curve. Japanese chef’s knives are gaining popularity as well. The Gyuto, or “beef knife” looks much like a French chef’s knife. Santoku knives are smaller and lighter, with sheep’s foot tips. These knives have slightly rounded tops and straight or nearly straight cutting edges. Last but not least, Chinese chef’s knives, called “Caidao” have rectangular blades. Also known as choppers or Chinese cleavers, they look very much like North American cleavers; the main difference is that a Chinese chef’s knife has a light, thin blade that offers the versatility to chop, slice, and mince a wide variety of foods. Chef’s knives are available at prices to suit every budget, beginning at less than $10 for poor-quality models and ending at well over $1,000 for very high-quality professional chef’s knives. Good chef’s knives for home use typically range between $20 and a few hundred dollars. How to choose a chef’s knife? Certain features make a big difference, imparting durability and contributing to its overall quality. Full Tang vs. Partial Tang – A full tang makes for a heavier handle, and it makes a knife stronger. Luckily, knives with partial tangs work just as well as those with full tangs, unless you’re doing very tough jobs such a disjointing large cuts of meat. Handle Material – Wood handles are nice, but they may require special care. Cheap, hollow plastic handles often feel insubstantial, and can be slippery. Textured metal and solid synthetic materials often feel good in the hand and they typically offer easier care than wood. Stamped Blade vs. Forged Blade – Today’s technology has drastically narrowed the gap between stamped blades and forged ones, so it’s possible to find good-quality chef’s knives in both categories. Ceramic Blade – Ceramic chef’s knives are in a category of their own – you’ll either love them or hate them. Available in different shapes and sizes, they are sharp and versatile, and they hold their edges well. Because ceramic blades are lighter and thinner than most steel ones, they’re best for lightweight tasks such as slicing vegetables and fish. You’ll want something a bit stouter if you tend to cut things like raw potatoes and carrots, hard squashes, and boned chicken. Sharpness – While the way you treat and sharpen your knives has much to do with their ability to hold an edge, certain brands are well-known for their ability to stay sharp over time. Cheap chef’s knives with thinner blades tend to dull as time passes, and eventually need to be replaced. Good ones from brands like Henckels, Shun, MAC, Messermeister, and Wusthof cost more, but typically stand the test of time. Weight – A chef’s knife’s weight determines what it’s best used for. 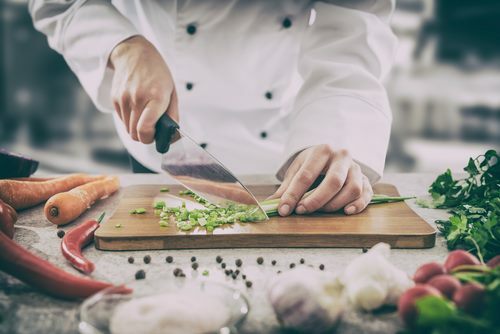 While all chef’s knives offer a good measure of versatility, you’ll probably enjoy a lighter one for tasks like chopping and slicing vegetables, and a heavier one if you tend to prep lots of meats or want to work your way through tough foods such as winter squash. Size – An 8-inch chef’s knife is suitable for most kitchen jobs, while a shorter size might not be long enough to handle large tasks. At the same time, a longer size might feel just right to a tall person with large hands, but oversized to the average person who isn’t handling lots of cumbersome food. Many cooks opt to keep a few different-sized chef’s knives on hand, but if you’re only looking for one, you’ll probably agree with the majority: 8 inches is a good, practical length. With these and a few other considerations in mind, we’ve read thousands of chef knife reviews and tested knives for ourselves to find quality options to suit discriminating cooks. Read on for our top ten choices as we review some of the best chef’s knives available. The Calphalon Katana is a standout Japanese Chef’s knife with a thin, 32-layer Damascus blade of VG-1 Japanese stainless steel for swift, easy slicing and excellent rigidity. An integrated bolster and patented, ergonomic polyresin handles offer a secure, comfortable feel. A lifetime warranty covers defects and inspires confidence in the manufacturer. The Calphalon Katana is a heavy chef’s knife with a good, solid feel. Cooks who appreciate the Santoku profile are likely to enjoy it and use it for a variety of kitchen tasks. The Damascus-style blade is meant for longevity, and when properly used with a good-quality cutting board, this knife offers years of steadfast service. Note that professional sharpening is recommended. 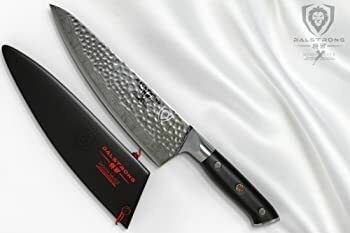 Part of Dalstrong’s Shogun Series, this 8-inch chef’s knife is crafted using the traditional Japanese Honbazuke method. With 67 layers of premium high-carbon stainless steel incorporated into its Damascus-style blade, an AUS-10V Vacuum Heat Treated Japanese super steel cutting core, and a hand finish, it has been nitrogen-cooled for added hardness, corrosion resistance, and flexibility. A full tang and triple rivets assure exceptional performance. The hammered tsuchime finish looks incredible, and offers the added benefit of redicing drag. The full tang is enclosed within a military-grade G10 fiberglass handle, which has been designed to offer an appealing combination of agility, comfort, balance, and exceptional control. The Dalstrong Shogun Series X Gyuto chef’s knife comes with a 100% satisfaction or money-back guarantee, and potential defects are covered by a lifetime guarantee. While some professional chefs enjoy working with this knife, it is priced to appeal to home cooks who want a premium chef’s knife under $200. Although this is a Japanese chef’s knife, its Gyuto design performs much like a French chef’s knife. 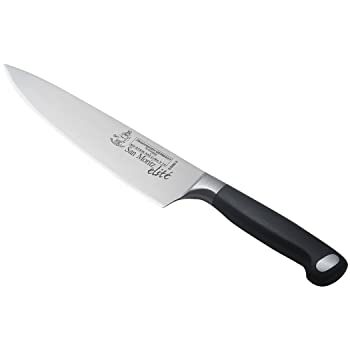 The weight is a bit heavier than that of a standard 8” chef knife, however the blade is a touch wider, offering a bit more breathing room for users with large hands. It is built to last a lifetime, and careful sharpening with a Japanese water stone will assure good performance for years to come. Designed for lightweight performance, the Global G-2 8-inch chef’s knife is made with high-tech Cremova 18 molybdenum and vanadium stainless steel. The edge has been honed to razor sharpness, and the molded stainless steel handle is dimpled for a safe, comfortable grip. The Global G-2 chef’s knife is covered by a lifetime warranty against breakage and defects. Global knives are handcrafted in Niigata, Japan. 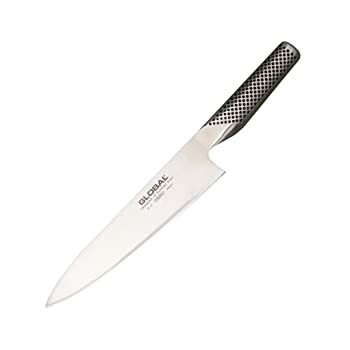 If you’re in search of a lightweight chef’s knife, then the Global G-2 is well worth considering. While designed for professional use and enjoyed by professional chefs, this knife is priced for affordability and will certainly satisfy the demands of serious home cooks. A tough, versatile chef’s knife with a high-carbon stainless steel blade with corrosion and anti-tarnish technology for lasting durability, the Imarku Pro Kitchen 8-Inch Chef’s Knife features a comfortable 5-inch Pakka handle. Its thin blade and ultra-sharp edge are designed to cut meat from bones and handle other demanding, heavy-duty tasks. Designed with good ergonomics in mind, this knife offers a balanced feel. The Imarku Pro Kitchen 8-Inch chef’s knife is lighter-duty and lighter weight than other poplar knives, with a thin blade that’s great for slicing vegetables. While it is not likely to satisfy professional chefs and serious home cooks, it’s a good choice for those who want a decent knife that satisfies the demands of a tight budget, and who don’t mind sharpening frequently. Made in Spain and crafted of high-quality German stainless steel, the J.A. 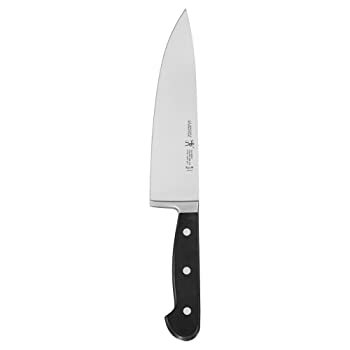 Henckels International Classic 8” chef’s knife features hot-dropped forged construction and a full tang. Its blade boasts a satin finish for precise cutting, and it arrives pre-sharpened for immediate use. Its polymer handle is triple-riveted for sturdy performance and a well-balanced feel in hand. Often hailed as one of the best chef’s knives in the $100 range, the J.A. Henckels International Classic comes from Henckels’ lower-priced product line and is intended for home cooks rather than professional chefs, who tend to feel disappointment when comparing it with knives from the manufacturer’s professional product lines. While it is a touch heavier than some other Henckels knives, it offers excellent performance so long as it is kept sharp and used with a good-quality wood cutting board rather than a metal, glass, or plastic surface. Note that this chef’s knife offers the advantage of being dishwasher safe; however, handwashing is likely to contribute to greater longevity. 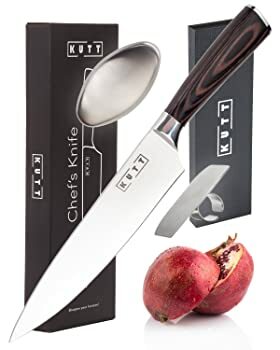 Made with FDA-approved German stainless steel designed to last for years while retaining a sharp edge, the Kutt Chef knife features a Pakka wood handle with an ergonomic, lightweight design. Designed in Europe and built to manage everything from meat to vegetables to bread, this knife comes with an odor removal stone and a finger shield. The Kutt Chef Knife satisfies most users, although many seasoned cooks note that it is not nearly as nice as a knife from a premium manufacturer. Most are satisfied with its quality to cost ratio, making it a good option for everyday use under average home kitchen conditions. While it’s not the best chef’s knife on the market, home cooks who want a mid-range, versatile knife will find that it serves as a good upgrade from a cheap, flimsy model. With dimples on its 2.5mm blade, the MAC 8-inch hollow edge chef’s knife glides through all types of food, including tough squash and potatoes. Its Pakka wood handle features a contoured shape for a comfortable grip. Its weight is a bit lighter than that of a similarly sized German-made chef’s knife. Available in a variety of sizes from 4” to 9”, the Messermeister Meridian Elite chef’s knife features a hot-dropped hand-forged blade of German stainless steel alloy that has been ground and hand-stropped to razor sharpness. The fully exposed tang is connected to the polyoxymethylene (POM) handle via three rivets. The handle itself is designed to offer a combination of industrial strength and ergonomic comfort. This knife’s heel features a shortened bolster that allows for full use of the blade while letting the user’s forefinger rest comfortably while controlling cutting actions. The Messermeister Meridian Elite chef’s knife is handcrafted in Solingen, Germany, and is covered by the manufacturer’s signature “Knife for Life” ™ guarantee against defects. Although the Messermeister Meridian Elite Chef’s Knife is priced around $100 and is often available at a lower cost, it gets good reviews from professional chefs and home cooks alike. Its quality and versatility make it a good addition to any busy kitchen, and when treated properly and sharpened regularly, it will last a lifetime. Note that the edge sharp and the knife is flexible, but that it is prone to damage when abused. The Shun Classic 8-inch chef’s knife is made with VG-10 stainless steel clad in 16 layers of high-carbon stainless steel. Its layered blade provides the look of Damascus steel, making an attractive addition to any cook’s collection. The handle is made of laminated Pakka wood, and is designed with a D-shape for added comfort. This Shun chef’s knife is made in Japan. It is NSF certified for use in commercial kitchens, and comes with a limited lifetime warranty. While it is marketed as being dishwasher safe, the manufacturer recommends handwashing and drying for greater sharpness and longevity. I really enjoy using this blade. I have been using it in a professional setting for about 6 months and with regular upkeep it’s become part of my mise. 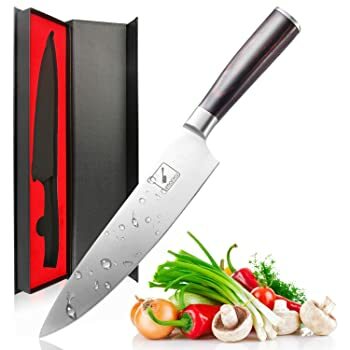 As a foodie who loves to cook, I recommend this Shun chef’s knife but must mention that someone who is not accustomed to a thin, uber-sharp blade might chip it; also, you want to avoid slicing anything with bone. Proper technique and care will allow you to enjoy this amazing knife for years to come. The Shun Classic 8-Inch Chef’s knife is enjoyed by professional chefs and serious home cooks alike. Do note that the blade is prone to chipping when subject to twisting motions, and that the tip is not well-suited to heavy tasks. If you want a great chef’s knife that can work its way through a wide variety of foods and don’t expect to utilize it for heavy-duty work such as chopping through bones, then you are likely to appreciate the Shun Classic chef’s knife. 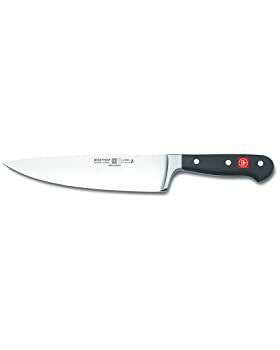 With a heavy, forged high-carbon stainless steel blade that has been hand-honed for exceptional sharpness, the Wusthof Classic 8” chef’s knife features a full tang and a seamless synthetic handle with three rivets. A full bolster and a finger guard add a measure of safety. Built for sturdy, reliable performance, this professional chef’s knife comes with a limited lifetime warranty. I purchased this knife in culinary school 20 years ago and am now passing it down to a young family member. Still looks and performs great. The weight is perfect with a nice heft to the handle, and great balance. Very sharp edge, cuts through anything without hesitation. The limited lifetime warranty is an added bonus! 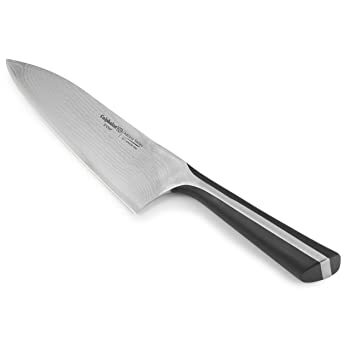 Wusthof knives have been chefs’ favorites since the early 1800s, and continue to be popular with professionals. This 8” chef’s knife is well-liked by almost everyone who uses it, from experts to occasional home cooks. Thanks to its pricing, which comes in around $100, it is more affordable than some others while offering near-comparable quality and exceptional longevity. When it comes to choosing the best chef knife for your kitchen, be sure to consider the type of tasks you do most often. A great chef’s knife is among your greatest allies for all kinds of cooking jobs, and choosing a cheap or flimsy one almost guarantees that you’ll find yourself replacing it within a disappointingly short amount of time. Get the best chef knife you can afford, and you’ll find that it serves you well for many years to come. If you have never taken the time to learn proper cutting and sharpening techniques, it’s a great idea to do so. Not only will you find new ways to use a chef’s knife, you’ll find that your speed improves with practice, so tasks take less time and effort. Last but not least, keep in mind that even the best knives can be damaged when they are used improperly, stored in a drawer while in contact with other hard objects, or even when twisted during removal from a magnetic knife bar. Storing knives in a block can lead to more frequent sharpening, so consider investing in a protective cover if your knife does not come with one. With these considerations, you’ll find the process of choosing the best chef knife for your needs a bit easier, and you will find that the knife you choose performs well every time you reach for it. Happy cooking!